Released on the 20th anniversary of their first EP, Impiety’s upcoming LP collects some of their rarer releases onto a single platter for perusal by slamming high-speed death metal maniacs worldwide. Compiling the Salve the Goat…Iblis Exelsi EP (1993), Ceremonial Necrochrist Redesecration demo (1993), split EP with Surrender of Divinity (2004), and the split EP with Abhorrence (2008), Vengeance Hell Immemorial assembles some of the more sought-after releases from this band’s history. A special gatefold vinyl pressing from Hell’s Headbangers, the compilation will be unleashed upon the world on June 28, 2013. 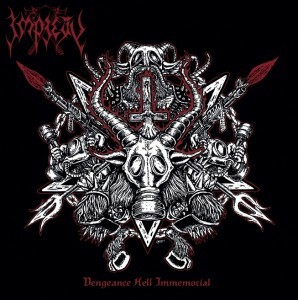 Less than a month later, on August 8 Impiety will unleash their new mini-album The Impious Crusade as if a nod to this grand tradition of shorter works, demos and EPs. Official band of the blogpost trolls, noble hessians, slayers of christians, and all warriors of death, worldwide! –Jim Nelson, righteous executioner of liberals.